Grain baggers and grain bag extractors are essential production tools for keeping grain bag commodity storage hassle-free and low-cost. They’re designed to make both filling and emptying your grain bags easier and quicker than manual labour. 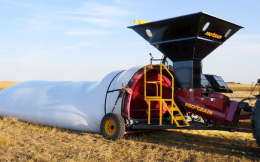 Connect your combine to your grain bagger to fill your grain bags with hundreds of bushels per minute. 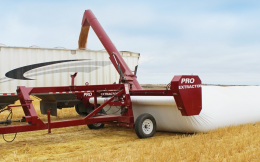 Once you're ready to take your crop to market, connect your tractor to your grain bag extractor for a controlled emptying process. Extractors use cross auger action to break up commodities before they hit the truck bed. Once you flip the switch you can expect a minimum power of 12,000 bushels per hour and 540 RPM sent to the bed of your truck for transport. The larger machines extract up to 18,000 bushels per hour. That certainly beats shovelling by hand! Get in touch with a Flaman team member to learn more about grain baggers and grain bag extractors. Check out the current selection from Pro Grain and Grain Boss.